There is only one region--the surface of the earth--on which mankind finds its home. Yet, although much effort is devoted by geographers towards the study of this diversified environment as a whole, it has long seemed necessary, by the methods of aespecial' or aeregional geography', to study its component parts. And although nature abhors lines, geographers might appear to adore them, so busily do they engage themselves in delimiting on their maps allegedly significant areas called aeregions'. As a result, every student of geography in school, college of education and university has been taught, read books, and attempted to answer questions on regional geography.The problem of region in geographic thought--how it may be defined, how it has developed, and how it is applied--has been vigorously debated within the discipline. In this incisive examination of the types of regions and regional methods treated in modern geography, Roger Minshull analyzes in detail the concepts of formal, functional, and city regions in an attempt to clarify this vexing problem.In addition to sizes, shapes, boundaries, and organization, the phenomena that usually form the content of regions are delineated in an attempt to define the nature of regional geography. As some regions are seen to be products of geographers' minds, it is suggested that certain influences, especially the methods of mapping the separate topics that form the content of regions, have been exaggerated. 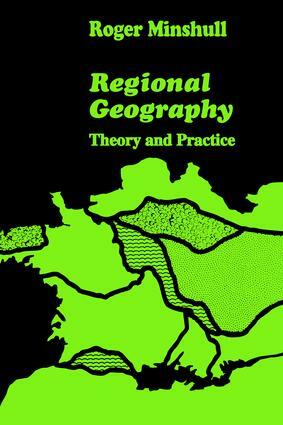 Regionalism and possible alternatives to the regional method are treated, and a large section of the book is devoted to the idea of the compage, in which the geographer's choice of topics and method of working is much freer than in more traditional approaches.